In addition, VOA’s programs stopped interviewing the Reformist figures in the Iranian diaspora or in Tehran. Several Iranian staff members who ran various VOA Farsi programs and were not comfortable with the sudden change of direction, either left VOAor moved to positions off camera. Another “fake” opposition group that has emerged over the past several months and is closely linked with the Trump administration and the neocons is called Farashgard(“revival” in ancient Persian). Its leading member is Amir Etemadi who, together with Saeed Ghasseminejad, co-founded the so-called “Iranian Liberal Students Group” (ILSG), a small ultra-right group of student activists in Iran, most of whom moved to Canada and the United States and supported George W. Bush’s policy toward Iran. Ghasseminejad is now “senior adviser on Iran” at the FDD. In his Twitter account, Ghasseminejad refers to himself as a “classical liberal and non-partisan,” despite calling for the execution of the Islamic Republic’s leaders after regime change and working for the very partisan FDD. A well-placed Iranian activist told the author that, in the run-up to the summit in Poland, Pompeo has invited several figures from the Iranian “fake” opposition to Washington for “consultation.” The apparent purpose is either to select some of them to take to Poland to speak “on behalf of the Iranian people,” to prepare some sort of “manifesto” on what the Iranian people want, or both. 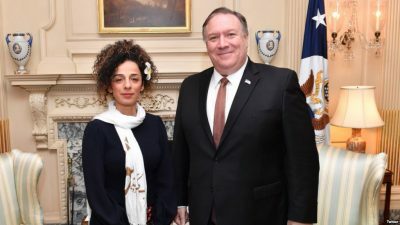 In fact, on February 4, Pompeo met with the VOA’s Alinejadand “underscored the United States’ commitment to help amplify the voices of the Iranian people and to condemn the Iranian regime for its ongoing human rights abuses.” This is while the United States continues to support Saudi Arabia and Egypt, countries that are gross violators of the human rights of their own citizens. After re-imposing harsh and illegal economic sanctions on Iran, threatening Iran repeatedly, and banning most Iranians from traveling to the United States, the Trump administration, in collaboration with the “fake” Iranian opposition, sheds crocodile tearsfor the Iranian people. In Iran, meanwhile, the people struggle daily on two fronts. They continue to survive the sanctions and threats, and the rampant corruption of the hardliners. And they continue to pressure these same hardliners to stop the repression, open up the political space, and allow for free and fair elections.